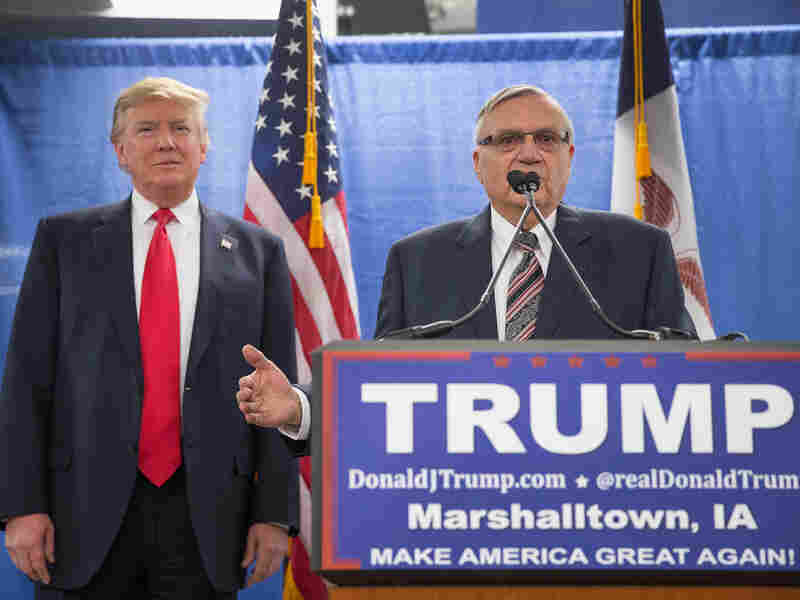 Senate Candidate Joe Arpaio Vows To Keep Pushing Birtherism : The Two-Way The ex-Arizona sheriff, who was jailed for criminal contempt before being pardoned by President Trump, says he has "100 percent" proof that former President Barack Obama's birth certificate is fake. Former Maricopa County Sheriff and U.S. Senate candidate Joe Arpaio speaks at his office in January in Fountain Hills, Ariz.
Joe Arpaio, the former Maricopa County sheriff who is running for U.S. Senate in Arizona, says that once elected, he will renew his quest to demonstrate that former President Barack Obama's birth certificate is a fake. Arpaio — who became famous for his controversial stance on immigration and for pushing the debunked claim that Obama was not born in the U.S. — was convicted last year of criminal contempt after defying a federal judge's order on immigration enforcement. Less than a month after being convicted, President Trump pardoned him. 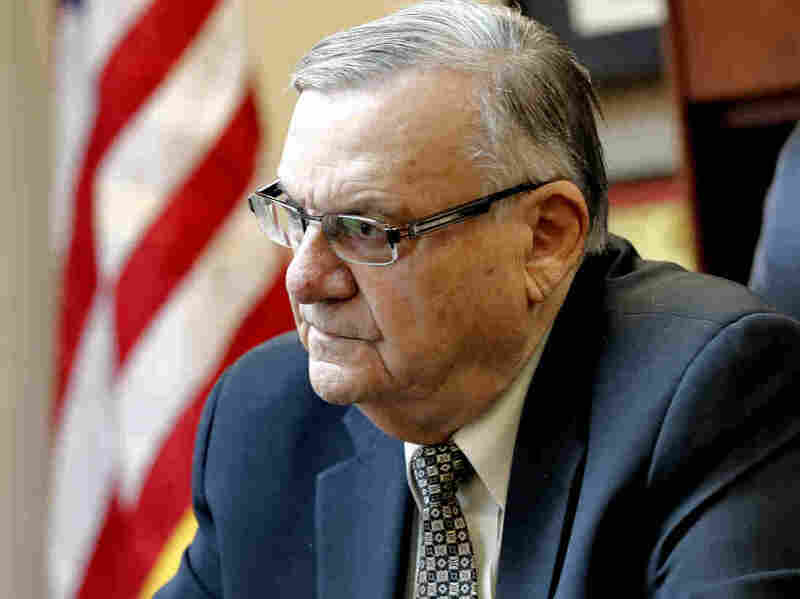 "I don't talk about it anymore, until I become a U.S. senator," Arpaio told a group of supporters at the Western Conservative Conference in Phoenix last week. "It has something to do with a document." "I'm nothing now, but if I were still the sheriff, I could ask for your birth certificate," he said jokingly, drawing out the last two words. "So, I'm kind of dropping that right now. But, I'm going to tell you something — 100 percent, we proved that's a fake document," he said. Arpaio suggested that "scientific" evidence would make his case. "We had to go to Italy to get expert advice. It's a very interesting story," he teased. The former sheriff also praised Trump, who for years was among the most vocal proponents of the "birther" movement, aimed at discrediting Obama. However, weeks before the 2016 presidential election, then-candidate Trump suddenly renounced that position. "President Obama was born in the United States. Period," he said at a campaign event 53 days before the election. Trump went on to blame campaign rival Hillary Clinton for inventing the controversy but offered no evidence to support that claim. Arpaio is running for the seat being vacated by retiring Sen. Jeff Flake. He faces two Republican rivals in the August primary — Arizona Republican Rep. Martha McSally and osteopathic physician Kelli Ward. A previous version of this story incorrectly said Joe Arpaio was pardoned less than a month after being jailed. The pardon came before he had been sentenced.